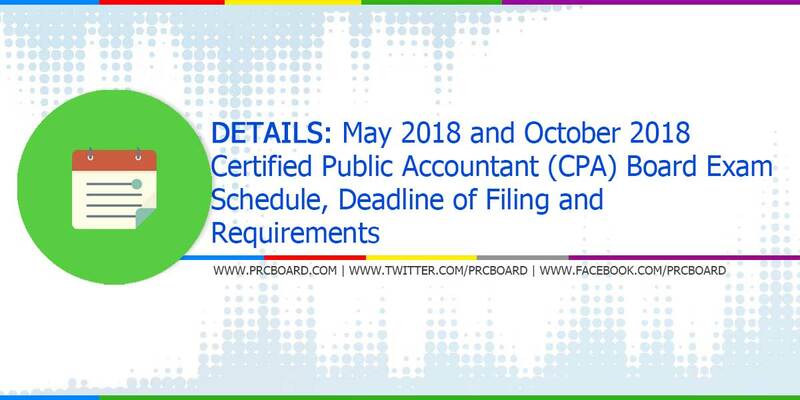 Manila, Philippines - The Professional Regulation Commission (PRC) announced the schedule of application, deadline of filing as well as requirements for application in May 2018 and October 2018 CPA board exams. The licensure exams for Certified Public Accountants (CPAs) will be held on the following dates at various testing centers in Manila and selected Regional Offices nationwide. Below is the detailed schedule for May 2018 and October 2018 CPA as per PRC Resolution entitled “Schedule of Licensure Examination for the Year 2018”. As prescribed by RA No. 9298, a citizen of the Philippines or an alien whose country has reciprocity with the Philippines can apply. The most recent CPA was held last October 2017 at selected Regional Testing centers nationwide. 4,511 out of 14,816 (30.45%) examinees successfully passed the exams. Results are released after ten (10) working days. In the same exams conducted May 2017 at selected Regional Testing centers nationwide, 3,389 out of 9,645 (35.13%) examinees successfully passed. Results are released after five (5) working days. On October 2016 CPA, 5,249 out of 14,390 (36.48%) successfully passed. Results were released after eight (8) working days. To receive fast and reliable news and announcements regarding the Licensure Examinations for CPA, we advise our readers to visit PRC official website or follow us at our social media accounts via Facebook and Twitter.